I live in the suburbs of DFW, which means getting good Sichuan food is not easy. Well, I mean, it’s easy, it’s just a 45 minute drive which is really a pity because I love Sichuan Food. So I have to resort to making it for myself. I made a super tasty Sichuan Pork Soup (minus noodles) and a Sichuan pepper cabbage, but Dan Dan Mein is something else. I love it but the noodles are an issue. In addition, it’s a multi-step recipe with making chili sauce, making the spiced ground pork, and then making the noodles. 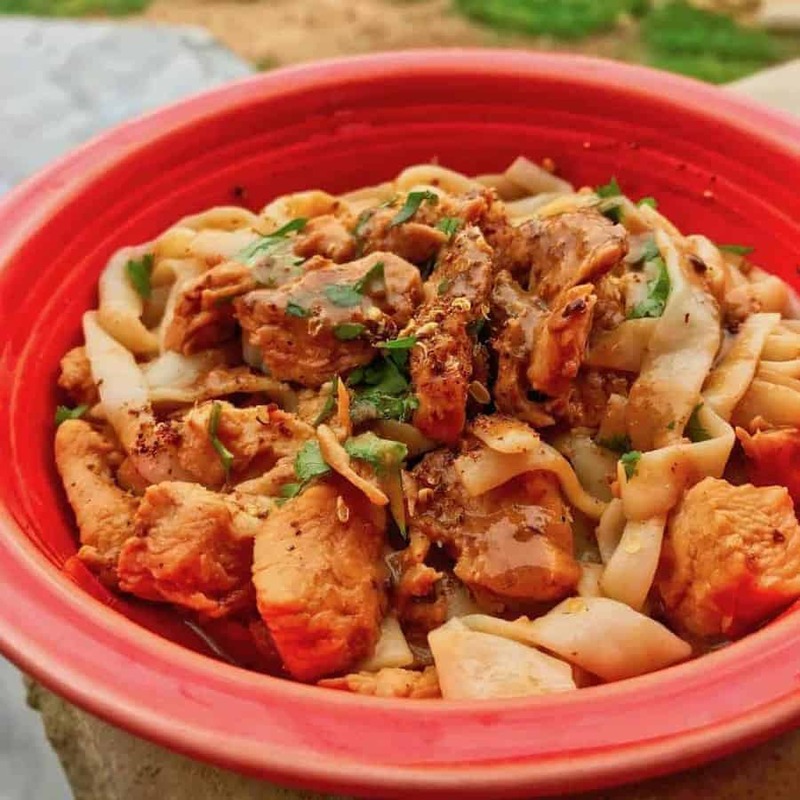 So I did some experimenting in the kitchen and came up with this delicious Dan Dan Style Chicken recipe! So of course I wanted a short cut. I basically made a sauce, cooked the chicken with it, and put it over shirataki noodles which are no-carb, and Roger and I scarfed it down. 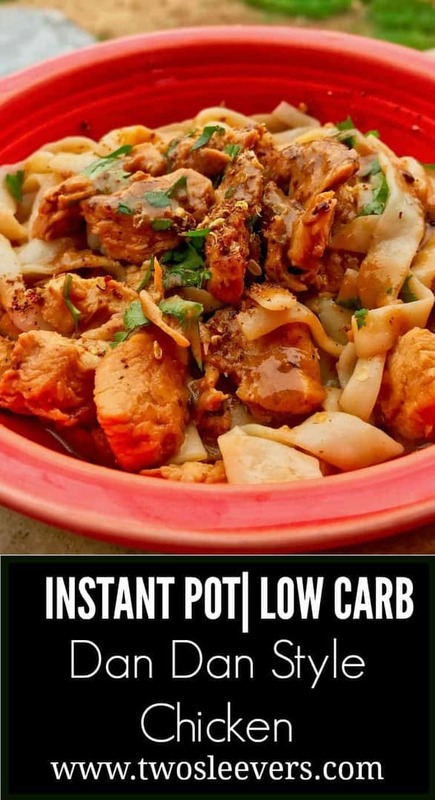 I made this in the Instant Pot but it can be made on a stove-top just as easily. LOOKING FOR MORE DELICIOUS SICHUAN RECIPES TO MAKE? CHECK OUT MY SICHUAN CUMIN LAMB RECIPE! Pressure Cooker Dan Dan Style chicken combines the classic flavors of Dan Dan Mein into a low carb dish that's equally satisfying. Blend together the sauce ingredients, using the hot water to help melt the peanut butter. Pour over chicken and mix well. Allow it to marinade for 30 mins if you have time. Mix with remaining water, and cook at high pressure for 7 minutes, use natural pressure release for 10 minutes, and then release remaining pressure. Mix with rinsed shirataki noodles and serve, garnishing with cilantro if desired. *I used crunchy peanut butter so I'd save yet another step in chopping peanuts to serve on top. Yup. I'm just that lazy 🙂 If you use smooth peanut butter, just scatter some roasted, chopped peanuts on the finished dish.